Brenda Lawrence, co-founder and executive director of Family Design Resources Inc., went away to college at 18. Some of her brothers and sisters left home to work and start families. If they ran into any problems, the siblings knew, their broader family was there for them. "It's more than who can you go to at Thanksgiving," Lawrence said. "It's about who can you go to when you have good news, bad news or need some advice." 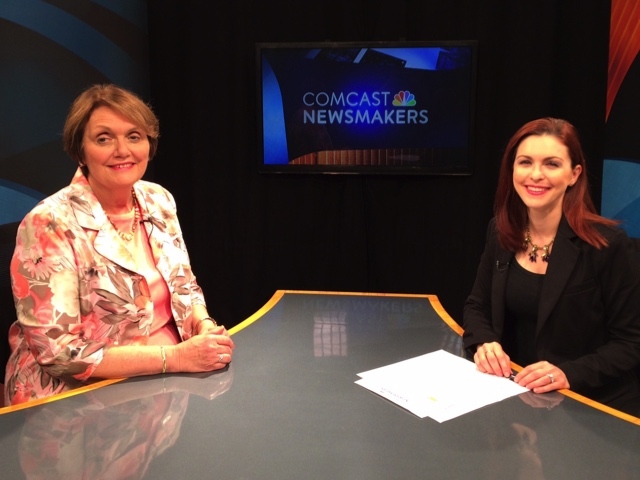 Lawrence (left in photo) made the point during her appearance on Comcast Newsmakers with host Jill Horner. They discussed the importance of foster youth finding permanency. "They need to know that they have a place to go at the end of the day and things that they can count on," Lawrence said. "It's very hard to be a child growing up or an older youth and not know what to expect the next day or when you get home or when you get up in the morning. "And it's really critical that they have that. We have a wonderful foster care system, but also that's a temporary situation. So our kids need to have something that they can depend upon in a current kind of way." Lawrence invoked the term "family privilege," which describes the benefits of a stable family that most of us take for granted. "Once you really are accepted into a family and have that idea that you're in that family because they want you for who you are, that level of family privilege is much different. Can I sit down in the TV room and put my feet up on the coffee table or not? Do I have that privilege? Are the snacks in the cupboard for me or just for the immediate family members?" Every year, some 1,000 foster youth in Pennsylvania and 30,000 across America age out of foster care, either because they were unable to find a family or chose to leave the system. because some of their family experience hasn't been very positive. "But what it can mean for a lot of them, the statistics have shown us, that they can fall into poverty, they can have early teen-age pregnancies, they can experience incarceration, and continue to be dependent upon public funding for their well-being." Horner noted the importance of foster youth thinking about permanency at a young age and the long-term positive benefit it can have on their lives. "Family can be there for you in all kinds of ways," Lawrence said. •	Making a monetary donation, which strengthens FDR's work to ensure that every person has permanency and place to belong.